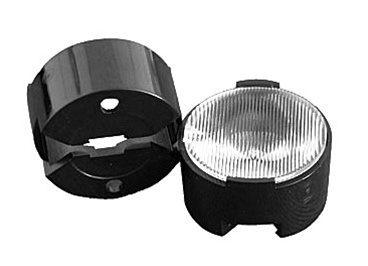 The Khatod 22 mm round 40° single LED lens is mounted into a black, flat bottomed holder making it very easy to secure the lens assembly directly to the PC board using our using our precision cut double-sided self adhesive tape. Manufactured from lens quality polycarbonate, this lens has a transmission efficiency > 90% and can operate up to 120°C. Use the KEPL115440 lens for your own lighting application by combining it with one of our Rebel Star LED assemblies. Rebel Star LED assemblies are available with any color of Rebel LED pre-mounted to 20 mm hexagaonal MCPCB or FR4 PCB. Note: This lens assembly is only available with a black holder.